(17/P4) TRENTON – The U.S. Army Corps of Engineers, working in partnership with the Department of Environmental Protection, has awarded a contract to construct long-awaited engineered beaches and dunes for the northern Ocean County peninsula, one of the areas hardest hit by Superstorm Sandy, Commissioner Bob Martin announced today. The Army Corps awarded a base contract of $92 million to Cranford-based Weeks Marine to conduct the first phase of construction. The total contract amount is expected to reach about $128 million as work progresses to additional areas of the peninsula where the state is continuing to work to secure access easements from property owners. The overall project will cover some 14 miles of coastline along the Barnegat Peninsula and will protect the communities of Bay Head, Berkeley, Brick, Lavallette, Mantoloking, Point Pleasant Beach, Seaside Heights, Seaside Park and Toms River. This is the last major stretch of beaches in New Jersey to be awarded a contract for construction of engineered systems of beaches and dunes. These systems are proven to protect lives, property and infrastructure, a major goal of the Christie Administration in the aftermath of Sandy. Work will begin in the spring and will progress in 1,000-foot sections to minimize impacts to residents and visitors. The Barnegat Peninsula was hit especially hard when Sandy slammed the state in October 2012. The ocean breached the peninsula in Mantoloking. Record storm surge caused significant damage to Brick, Lavallette. Mantoloking, Seaside Heights, Seaside Park and the Ortley Beach section of Toms River. Homes, businesses, piers, boardwalks and infrastructure – including State Route 35 – were destroyed or severely damaged. These areas did not have properly engineered beached and dunes when Sandy hit. Engineered beaches and dunes block and absorb the impact of storm surge, mitigating property damage. 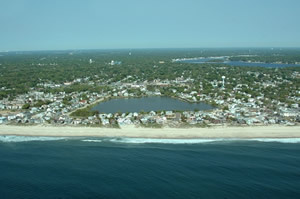 A key component of the project is the construction of dunes and beaches along a four-mile stretch of sea wall in Mantoloking and Brick that the DEP teamed up with the New Jersey Department of Transportation and the Federal Highway Administration to build as added protection for Route 35. This is the main artery and coastal evacuation route through a particularly vulnerable stretch of the peninsula that was severely damaged during Sandy. This highway, since reconstructed to modern design standards with extensive flood controls, was the scene of a major breach at the Mantoloking Bridge during Sandy. The four-mile-long protective wall is comprised of steel sheet pilings driven deep into the sand that will serve as emergency backup protection, with the beach and dune system providing primary protection to the roadway. Work will begin with beach and dune construction in southern Mantoloking, as well as all of Lavallette, Toms River, Seaside Heights and Seaside Park. Work in Bay Head, Berkeley, Brick, northern Mantoloking and Point Pleasant Beach will begin after all necessary easements have been obtained. A total of 545 easements are needed for the project. An easement is a legal right of access to private or municipally owned property the Army Corps and DEP need to perform construction. Nearly 350 easements – or 64 percent – had been provided voluntarily. The state also obtained 54 additional easements through condemnation proceedings under the Eminent Domain Act and is pursuing additional condemnation proceedings. “The Governor and I are grateful to the majority of property owners who voluntarily provided their easements because they recognize that this is the right thing to do for their neighbors and their communities,” Commissioner Martin said.